The google map (above left) shows Varda's path. This path takes into account the rotation of the Earth during this relatively slow event. 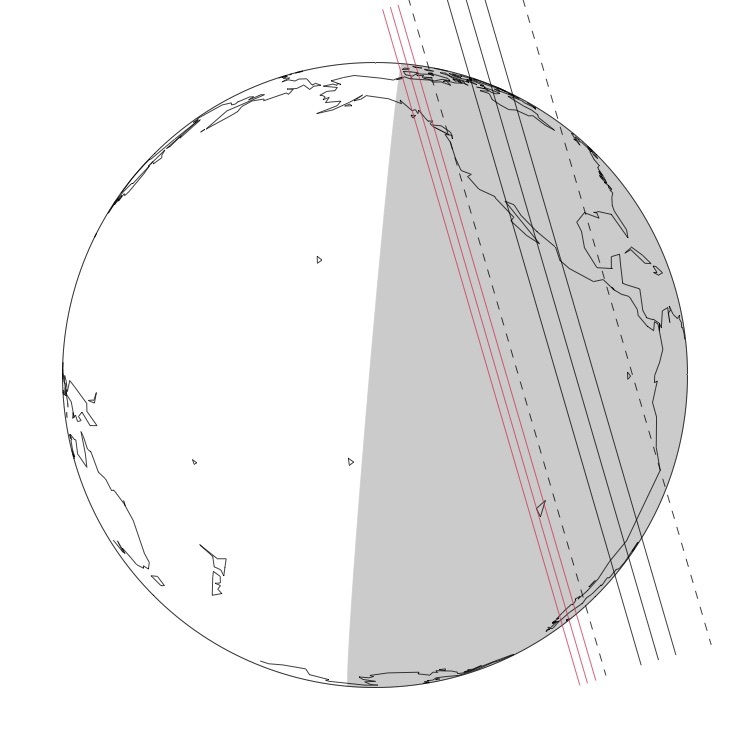 Across the globe pictured (above right), the three solid black lines correspond to the northern limit, centerline, and southern limit of Varda's shadow. The eastern and western limits correspond to a radius of 370 km. The dashed lines indicate 3-sigma errors. Ilmare, assumed to be 163 km in radius, is outside Varda's 3-sigma errors and illustrated by the three solid red lines. The shaded area on the globe represents where the sun is more than 0 degrees below the horizon. The shadow paths on the globe are an approximation at the geocentric close approach time; they disregard the Earth rotation during the event. We would like to thank Gemini North for allocating 30 minutes of DDT, allowing us to study the target star for potential duplicity through speckle imaging. The data acquired with the 'Alopeke instrument indicates that the star is not a binary. 3Measured position corresponds to RA offset of +0.0 and Dec. offset of –0.0. 4Data analyzed using Gaia DR2 reference network. A weighted average of the data from the two telescopes was used to calculate the RA and DEC. The errors given are 1 standard deviation. 5The reference positions for Varda are those given by JPL Horizon's ephemeris (Varda source file: JPL7; Earth center source file: DE431). 6Data from the 4.3-m Discovery Channel Telescope (DCT) over the span of 8 months were reduced with respect to stars in the Gaia DR2 catalog. A model was developed to fit the residuals obtained from our measured positions compared to that of the object's JPL ephemeris. All residuals obtained from the different telescopes were consistent with the model. The model includes the first-order effects of errors in the orbital elements of Varda: (i) constant offsets in RA and Dec, (ii) linear (in time) offsets in RA and Dec, and (iii) sinusoidal terms with Ilmare's period. The model was propagated to obtain the predicted position and error of the KBO at the time of the occultation. The errors listed for the KBO are 1 standard deviation. 7"Distance" refers to the closest approach distance of the "Site" to the center of Varda's shadow in the shadow plane. The errors on all closest approach distances are ±249 km (one standard deviation). "S." means the site is south of the center of Varda's shadow. "N." means the site is north of the center of Varda's shadow. 9The errors on all times are ±0:28 (28 seconds; one standard deviation). The solar altitude is given for locations where it is relevant (solar altitude greater than -18°). No entry in the immersion and emersion columns indicates that the occultation is not predicted to be visible at that site.